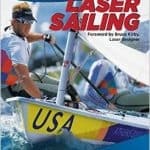 For anyone who has never sailed a laser, they may not understand the importance of laser sailing fitness. One of the main reasons why the Laser is so popular is its simplicity; simple to rig and sail, sturdy and agile on the water. 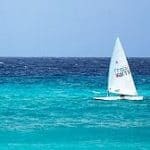 But don’t let the Laser’s simplicity fool you into believing anyone can sail it; Laser sailing fitness is essential for injury prevention and as an added bonus, sailing the boat in itself can give you a good workout. 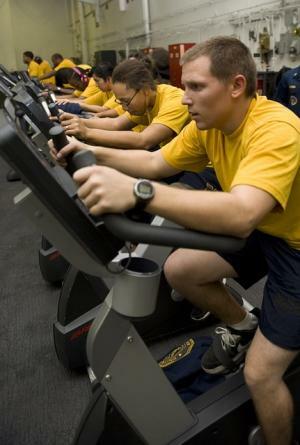 Sailors who hike hard for instance, rely on muscle groups in the arms, abs, thighs and hips, while sail trimming requires highly trained arms, shoulders and core. 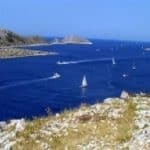 Why is laser sailing fitness important? The Laser is an Olympic-class boat. Racing a Laser particularly requires a unique set of physical skills and fitness; in fact an advanced level of laser sailing fitness is required to be competitive. 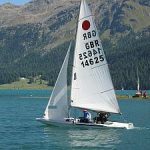 It is one of the most popular single handed sailing dinghies in the entire world and provides competitive racing because of the association’s tight class controls. This means no differences in sails, hulls and other sailing equipment. All Lasers are built to tight specifications; the hull is 4.23 metres long and weighs in at a mere 56.7kg. The Laser has one main sail, but has 3 different sized rigs, which you can choose depending on your size, fitness and ability. The boats all look much the same; identical really, so when a boat wins a race, you can safely say it was the skills of the sailor that made the difference. Manufactured by different companies in various countries, although it is a small single-handed sailing dinghy, it may be sailed by two people, but this is generally not the case. 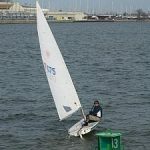 There are three different types of rigs for a Laser dinghy; the Laser 4.7 (which has the smallest rig and is typically for the lighter sailors), Laser Radial, and the Laser full rig. The Laser is suitable for both men and women sailors of all ages and are raced by beginners right through to advanced. Rigs are selected according to body size and weight. Hiking is essential with dinghy sailing; the action of moving the body weight as far to windward as possible, so as to decrease the extent that the boat leans away from the wind. The boat can easily capsize unless the sailor counteracts the wind’s force by hiking. You can even buy a hiking bench to practice hiking techniques, and just 10 minutes a day working out on it will strengthen hiking muscles and abdominal core muscles. Hiking puts demands on the abs, lower back, quads, shoulders and neck as well as knees and ankles. A base level of aerobic fitness helps too because the effort required while you hold the sheet at the same time as hiking calls for a high level of stamina as well as the ability to think clearly. Physical fitness, along with tactical intelligence, go hand in hand with successful sailing and winning races. Many sailors manage their weight, as too much weight will result in a slower time around the course. Increasing strength while decreasing body weight requires performing higher reps of moderate weight loads. 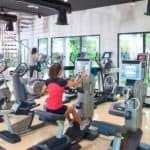 For many sailors, fitness training involves modelling other sailors who have undergone strength training which has resulted in aerobic endurance, cardiovascular fitness, increased strength and flexibility. Agility exercises also improve hand and eye coordination. 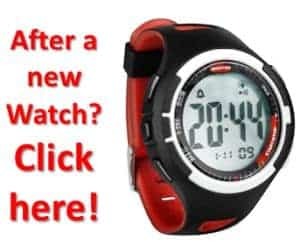 Robert Scheidt, born in 1973, is a renowned Brazilian sailor who has won two gold medals and many others from five Olympic Games, while Tom Ramshaw is a typical example of a young sailor preparing to represent Canada in the 2016 Olympic Games. He joined a cross-fit gym to participate in workouts which allow him to push himself physically while hiking in his Laser. Both sailors realize the importance of laser sailing fitness and preparing to get super fit for the Olympics and any races they participate in. There are few one-design classes which can display a sailor’s skills and physical fitness like the Laser. When you start researching the most successful Laser sailors, it is clear that fitness equals speed, agility and clarity of mind. With laser sailing fitness, having a high strength-to-weight ratio enables you react faster and hike harder, enabling keen sailors to set goals and achieve them.